What’s Love Got to Do with It? is an insightful debunking of the way charitable giving disguises American neglect of the public welfare. Award-winning professor of social work and sociology David Wagner points out that while the United States prides itself on being one of the most generous nations, it provides its citizens with the lowest public benefits of any Western society and has rates of poverty and inequality among the highest in the industrialized world. These two facts, Wagner argues, are not unrelated: independent philanthropy actually provides a cover for the harshness of America’s free-market capitalism. 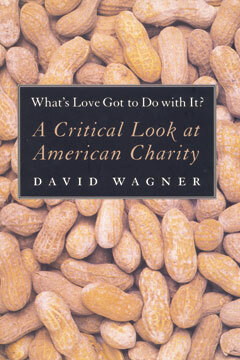 In a book that Howard Zinn, author of A People’s History of the United States, says “raises sobering questions for all of us who want to live in a just society,” Wagner offers a provocative contribution to our thinking on philanthropy and social welfare. David Wagner’s previous books include the award-winning Checkerboard Square and The New Temperance. He is a professor of social work and sociology at the University of Southern Maine.